The quote fits today’s natural gas sector to a T.
Gas producers are increasingly bearish on prices for their sector. You can see it in their hedging. Look at the numbers. In 2011, Canadian gas producers surveyed by this letter hedged AECO-sold production at $5.27. Hedge prices have dropped steadily for gas sold since—to $4.27 in 2012, and to $3.29 for currently-hedged production in 2013. The falling hedge price of course makes sense. 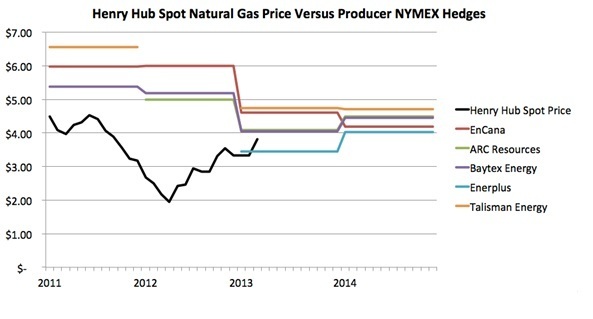 Natural gas prices fell steadily from the beginning of 2010 through to early 2012. Faced with two years of declines, producers looked to stave off further price risk by forward-selling their output. But something different has been happening since the second quarter of 2012. Gas prices have been rising. The monthly average AECO (the Canadian benchmark price out of Edmonton AB) price is up 110% over the last year. NYMEX gas has gained 95%. Producers, however, have not responded with optimism. Despite stellar gains in the gas price, firms continue to hedge at low levels. In fact, for the first time in years, hedges appear to be working against producers—forcing them to sell gas at prices below market value. In fact, one junior producer says they’re starting to re-think their hedging strategy. “We’re actually thinking of unwinding some of our gas hedges now—at least in part,” says Heather Christie-Burns, President and COO of Angle Energy (NGL-TSX). “Our hedge book for natural gas is in a loss position right now, for what our strip pricing was then.” She adds that Angle does not have any hedging on for 2014. So, could a rising commodity price and continued bearishness from industry insiders be a recipe for investor profits? Below I survey current hedge books of major gas players—and look at what this sentiment means for these companies in the current market. Hedging: A Good Idea Gone Bad? To see what hedge books tell us about the direction of the natural gas market, I surveyed nine major, Canadian-focused gas producers and their hedges. Investors can find this information buried in the back of annual financial statements for most companies. The charts below show the average hedge prices producers locked in for the last three years—plus any production already hedged for 2014. The results tell us a few things. For one, they confirm that hedges are now starting to work against producers. As mentioned above, in 2011 my surveyed producers hedged AECO gas at an average of $5.27. During that year, AECO spot had a monthly average of $3.48. Hedging paid off. Same in 2012. 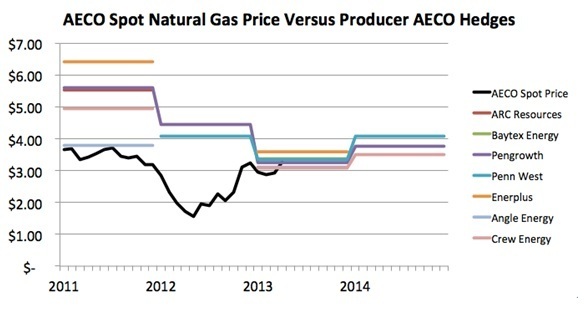 During that year, producers hedged at an average $4.27, while AECO prices averaged $2.28. But with prices rising through most of the past year, hedgers are now close to underwater. The average AECO hedge for 2013 is $3.29. But AECO prices have averaged $3.01 through to the end of April—a razor-thin discount to hedged prices. In fact, prices for April averaged $3.28–right at the strike price for the average hedge. Producers that hedge on the NYMEX—indexing their sale price to Henry Hub rather than AECO—have seen a similar pattern. NYMEX hedgers locked in an average $5.97 in 2011—nearly a 50% premium to the average Henry Hub spot of $4.00 that year. In 2012, the average hedge of $5.40 was almost double the $2.75 average hub price. But the differential has now narrowed. NYMEX hedges for 2013 average $4.19, while the spot Henry Hub price through the first quarter of the year ran at $3.49. As the chart below shows, NYMEX hedges are fairing a little better than AECO hedges in maintaining a premium—but the gap is closing fast. Here’s the most interesting part. Despite the doubling of gas prices over the past year, producers are continuing to hedge year-out production at relatively low prices. The average AECO hedge price for 2014 is $3.80—just 15% higher than the $3.29 producers hedged at in 2013. For NYMEX production, the hedging outlook is even less optimistic. NYMEX hedges for 2014 average $4.38. That’s barely above the $4.19 average for 2013. These low-price hedges are looking like an increasingly risky bet. If prices rise just a little, producers will be losing money on the forward sales that previously improved their bottom line. Despite this risk, gas companies are continuing to hedge aggressively. Look at the historical pattern. In 2011—when AECO prices were holding in the $3 to $3.50 range—AECO-hedged producers grew more optimistic. Only two of them, Pengrowth (TGF-TSX) and Penn West (PWT-TSX), hedged AECO production in the next year, 2012. Others tried to maintain exposure to spot prices, believing things could improve. Of course, 2012 turned out to see a cliff-dive in the AECO price, to below $2.00. That spooked producers. To the point where, even though we’re back at the same +$3 prices we saw in 2011, gas players are continuing to hedge heavily. Where only two companies hedged at these levels before, six firms are hedged for 2013 and three companies are already hedged for 2014—at the low prices mentioned above. This looks like a classic case of the “know it best, love it least” syndrome, meaning this could be a buying opportunity—at least for the right companies. With more firms hedging, investors looking for upside from rising gas prices need to be careful about where they put their money—especially today. With hedging activity rising the last few years, good deals in the hedge market are getting hard to find. You can see this in the spread. In 2011, average AECO hedges for our surveyed companies ranged from a low of $3.81 (Angle Energy, NGL-TSX) to a high of $6.43 (Enerplus, ERF-TSX). That’s quite a difference in prices and profits! But today elevated prices are hard to come by. 2013 hedges have a tight spread, ranging from $3.09 (Crew Energy, CR-TSX) to a high of just $3.37 (Baytex Energy, BTE-TSX). If you’re hedged today, you’re getting a mediocre price for your gas. Plain and simple. The good news for investors betting on a rising gas price is that not all companies are hedging the same volumes. 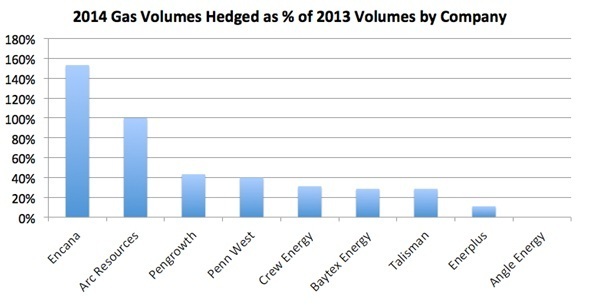 The chart below shows gas volumes hedged for 2014 as a percentage of 2013 hedge volumes. A value above 100% means a firm is hedging more gas next year than they did this year. Companies like EnCana (ECA-TSX) and ARC Resources (ARX-TSX) are hedging as much or more gas next year. While firms like Crew Energy and Enerplus appear to be keeping significant volumes uncommitted for now—perhaps looking for price appreciation. Angle Energy is our sole surveyed producer that has not hedged any output for 2014. “I don’t think NYMEX natural gas prices are going to rock over $5/mcf, but it could touch $5,” says Christie-Burns. “There is a ceiling, there’s a lot of coal. But good hedges by the majors have allowed a lot of activity over the last two years, and now they aren’t making money on them. They can’t redeploy hedging gains back into more drilling like the last couple years. Next post: A Futures Market for North American LNG Exports? Natural Gas Liquids. Components of natural gas that are liquid at surface in field facilities or in gas-processing plants.